Believe it or not, football and paintball have a lot in common. Both need teamwork, sportsmanship, good communication from each player and require tactics in order to achieve victory. There’s also one other key similarity – both involve a lot of diving. Ok, so there are two similarities, that and they’re both awesome to play! With football we start playing at an early age so why should paintball be any different? Delta Force Paintball’s mini-paintballing event is tailored specifically for 8-10 year olds. Equipped with smaller weapons and ammunition, plus padded body armour and full marshalling supervision throughout the paintball games, kids can experience the exciting sport of paintballing in a safe and fun environment. 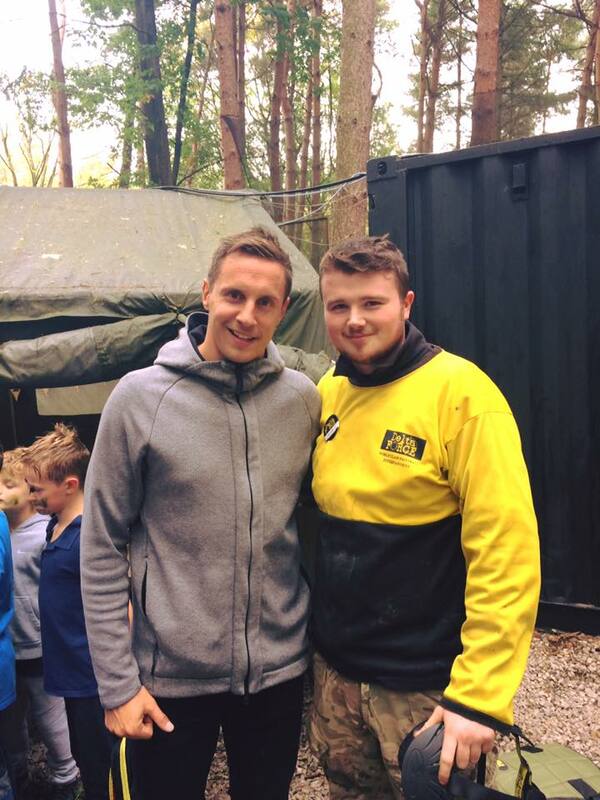 In fact our kids’ miniball events are so popular that we recently had Everton Captain and England’s defender Phil Jagielka, bring his son to Delta Force Manchester for an afternoon of miniball mayhem. Phil was even kind enough to take a snap with our Delta Force staff. Being skipper at Everton for the past four years, Jagielka has said that teammate Wayne Rooney’s return to the team has been a great influence on the youngsters. We can certainly vouch for that as we’ve also had England star Wayne Rooney along with his former teammates at Manchester United play a few rounds at our Delta Force paintball centre in Holmes Chapel. Our nail-biting mission scenarios require solid defending and a strong attack, so it’s no wonder we’re a hotspot for sporting heroes. Delta Force Paintball has been awarded a 5 star rating for health and safety by the UKPBA so you can be sure that your young protégé will receive full guidance and training before pacing across our varied game zones and return home buzzing with excitement. This exhilarating activity is for kids 8-10 years old and we offer an all-inclusive package deal starting from just £29.99, including plenty of paintballs to cover the entire session. Kids aged 10+ years can also check out our Young Guns prices that perfectly cater for children’s birthday parties, family trips and school outings. Call 0203 869 9301 now to book your session or complete the mini-paintball enquiry form online.